Most Whitetail Deer Hunters are not all about Trophy Whitetail Deer Hunting. They hunt whitetails for the meat and to be doing something they enjoy with family and friends. 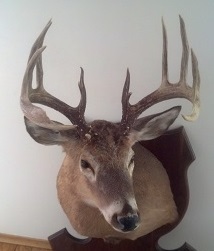 I have spent most of my life working to harvest trophy whitetails each season. Most of the time for me it pays off. Like in the picture below. I have a couple of other pictures I will share further down the page. I start looking for a Trophy after the hunting season closes in the late fall. I keep my cameras out all year round. When I find a scrape or rub line I mark it with flagging tape. One color for rubs and one for scrapes. I also mark the trails. Because I have hunted this property for many years I know a lot of where these are but if you do not then it will take time and effort to do this. You will get out of it what you put in it in time. As long as I can get onto the property I go by each month to check cameras and trails, especially if we have some snow. Snow is especially helpful with Trophy Whitetail Deer Hunting Tips. The tips come from the deer themselves, in the form of pictures and tracks. If you find a single good size track that crosses other well used trails chances are it is a buck. If you find a well used trail put out a camera to see what is around. This is a lot of fun and it keeps you outdoors in the winter. Just make sure you practice not leaving a lot of scent around when you do go into the field. Hopefully you will get some pictures of the deer that survived the hunting season. The next time to get real serious is the spring, looking for shed antlers. Finding them will tell you what bucks survived into spring. Trophy Whitetail Deer Hunting can be very Disappointing. Trophy Whitetail Deer Hunting can be very disappointing. 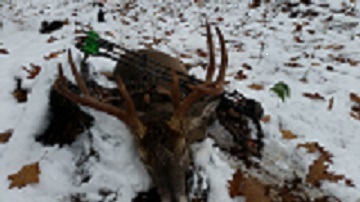 A few years ago I was hunting a nice 10 Point and had him finally figured out as I watched him go into his bedding area but he was too far for a clean shot. So I waited until well after dark and left the area a quietly as possible. The next weekend I came back well before light to move my stand to a spot I had already picked out down wind I hoped. When I got there I found fresh snow and a fresh drag line and my heart sank. 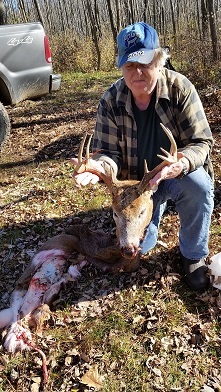 Knowing the other hunters I hunted the property with I thought maybe it was just a doe or smaller buck they harvested. So I hunted the morning until about noon and went to our camp. Guess what, there was the buck I had been after since bow season hanging from our tree at camp. The hunter that took him said he got lucky to come up on him in his bed, of course when I told him I have been after him all season he started to tell me what a great hunter he was. Not to be a poor sport I hung around the rest of the season. So remember even after you put in all the work and you think you have the buck you are after figured out this happens. So after the season is over you start again. This is what happens when you put every thing into one Trophy Deer, you sometimes go without. During the early summer I work getting my food plots ready for seeding in mid to late July. The ground needs to be turned over and lime and fertilizer put down. I then seed the property. Late in August after things have started to come up, I hit it again with fertilizer. The better the crop the better for the deer and other wildlife. Now I have all my cameras out on the food plots. It won't take long before the bucks show up to eat. It’s just a matter of time and effort to start trying to figure out their pattern. Of course things will make a dramatic change come late into October and early November. The bucks will start looking for does to mate with during the rut. When a mature buck turns to the does, this is the time you may have a chance to outsmart him. Keep working and keep checking your camera, looking for rubs, scrapes and other sign. Hey! With the hard work and time put in and some luck for good measure you could get the chance of a life time. Be ready for that shot with the bow or gun. Practice, practice, and practice more. You owe it to this most beautiful and majestic creature that God has given us. One other piece of advice for trophy whitetail deer trophy hunting, be ready for that shot with the bow or gun, Practice, practice, and more practice. You owe it to this most beautiful and majestic creature that God has given us. Remember Trophy Whitetail Deer Hunting is a privilege, not a right. Now is the time to get up and get out there to find a buck like the one I harvested a couple of years ago or the one up above this paragraph that I was very lucky to take last year. I had been looking for him and working to get the right spot. I settled on the right spot I thought, a doe came in and was very nervous, I knew she did not make me. I saw a set of legs behind her and then heard a deep grunt. Of course I know it was a buck but which one. He came out and gave me a shot at 30 yards broadside. I lost him in my peep and had to let down and redraw. Reminding myself to breath and concentrate on the spot I wanted to place the arrow and not look at the antlers anymore. It is the right thing to do let the Trophy Whitetail Deer go than wound it and not recover the animal. Luck would have it he stood still long enough for me to put an arrow into and out of his lungs. I watched him drop less than 100 yards away. Best of luck with your trophy whitetail deer hunting. Stay Safe.